On 1 and 2 June 2017, this year's CETOP General Assembly and the related Commissions' meetings took place in Barcelona, Spain, hosted by the Spanish CETOP member AIFTOP. The Commissions are concerned with technics, marketing, economic and education issues. The Technics Commission for instance dealt with some EU Directives and regulations having an impact on fluid power: PED Directive, Ecodesign Directive, REACH and CLP, ROHS. 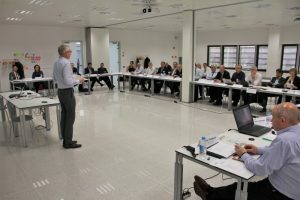 In the joint meeting of the Marketing/ Communication and Economics meeting, matters such as CETOP promotional activities, for instance a flyer, the CETOP Directory as European buyers' guide, and market data, statistics definitions, etc. had been discussed. The Education Commission has been concerned with CETOP Education Recommendations. A SWOT analysis completed the ambitious and comprehensive program.